In keeping with our “dog days” theme this month, I was reminded of this very charming mystery featuring Randolph, the intellectual black Labrador, and his owner Harry. Randolph is not only bright enough to speak (to us only, though—in his own world he is mute) but to read, and as the story opens he is reading the Pinsky translation of Dante’s Inferno, which he deems excellent. Although Harry has some respect for Randolph, and babbles on to him quite without restraint, he obviously doesn’t have a clue about Randolph’s hidden gifts. Both Randolph and Harry are mourning the absence of Imogene, Harry’s girlfriend and Randolph’s previous owner, who mysteriously disappeared a year before. While moping around Manhattan, though, they become entangled in a murder mystery, which requires the use of both human and canine abilities. I have to admit that mysteries featuring animal detectives aren’t normally the first to spring to the top of my to-be-read pile. If they do for you, more power to you, because I definitely think you’ll be charmed by Randolph. But for those like me, let me point out a couple of virtues of this novel. First is the sensibility of the author himself, who, judging by interviews and the like is a very thoughtful guy. Despite the cozy form this book easily fits into, there is a philosophic strain that runs beneath the surface that is not light or simple. Waiting to find out what happened to Imogene is a condition of some agony, which Englert discusses in an interview I will link to below, and Randolph is better suited to this wait than Harry. Which brings me to the second point: Englert says that Randolph “sprang into life basically complete”, and Englert afterwards did his best to see the world from a dog’s point of view and to tell the tale from that viewpoint. One of the things that has really stuck with me from my reading of this book, which was a few years ago now, is that canine perspective. The sense of scent, which figures in an important way in this story, is highlighted, but I also recall that Randolph’s hearing and vision come into play as well. 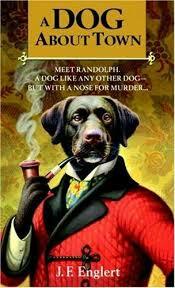 I believe that to this day I see and think about dogs differently as a result of reading this novel. Did I say two things? Well, let me throw in as a third the lively and deft quality of Englert’s prose. This is a very enjoyable book, perfect for summer, and luckily for you (and me), there are two more Randolph and Harry novels that follow this one, A Dog Among Diplomats, and A Dog at Sea. That ought to float your boat for awhile.